Jimmy Knepper (tb), Gene Roland (tp), Bob Hammer (p), Teddy Kotick (b), Dannie Richmond (ds). Recorded September, 1957, NYC. 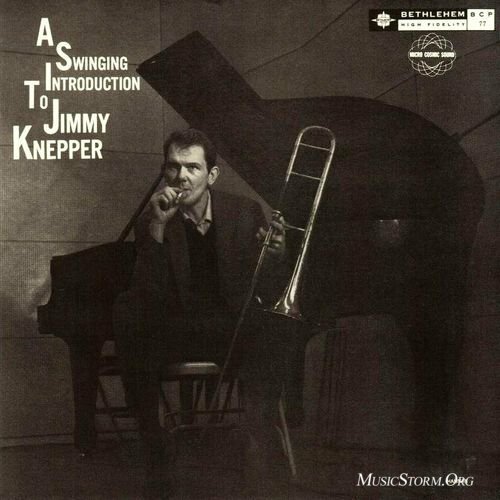 James M. (Jimmy) Knepper (November 22, 1927 – June 14, 2003) was an American jazz trombonist. He was a good friend and arranging/transcribing partner of bassist and composer Charles Mingus. Knepper was twice on the receiving end of Mingus’ legendary temper. While onstage at a memorial concert in Philadelphia, Mingus reportedly attempted to crush his pianist’s hands with the instrument’s keyboard cover, then punched Knepper in the mouth. On October 12, 1962, Mingus reportedly punched Knepper while the two men were working together at Mingus’s apartment on a score for his upcoming concert at New York Town Hall and Knepper refused to take on more work. The blow broke one of Knepper’s teeth, ruined his embouchure and resulted in the permanent loss of the top octave of his range on the trombone. This attack ended their working relationship and Knepper was unable to perform at the concert. Charged with assault, Mingus appeared in court in January 1963 and was given a suspended sentence. Knepper died in 2003, after a long battle with Parkinson’s disease. The post with a special dedication to the memory of Erling Kroner.